GM has autonomous, electric pods that can be summoned by a smartphone and will whisk you, hands-free, to wherever you want to go. They’re almost ready, now we just need to wait for GPS to catch up. GM’s Electric Networked-Vehicle (EN-V) was an instant hit when it was first unveiled last year; the electric, autonomous (no steering wheel!) 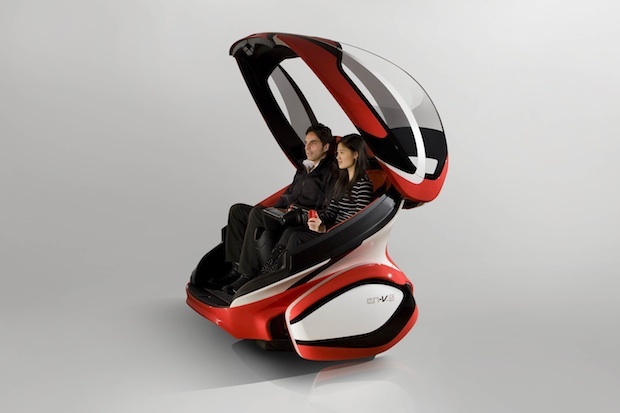 pod-like car is nothing if not futuristic and friendly-looking. It’s like GM finally offered us the Jetsons future that we’ve all been waiting for. GM denies the recent rumors that it has set a production date for the EN-V, but rest assured, it’s coming. We spoke to Sam Abuelsamid of GM’s advanced technology communications team to get the details on when we’ll all be pod-driving people. Once the EN-V is ready for production, it could be deployed in any number of places–gated communities, college campuses, and megacities, where pollution and overcrowding could be alleviated by the emissions-free pod cars. Abuelsamid also speculates that the EN-V could make an ideal addition to a car-sharing service, since users could both summon the vehicle using a smartphone app and tell the EN-V to park itself when they’re finished using it. GM is rumored to be in talks with cities in China, South Africa, and the U.S. about creating an infrastructure for the vehicle, which will cost approximately $10,000 when it goes on sale.